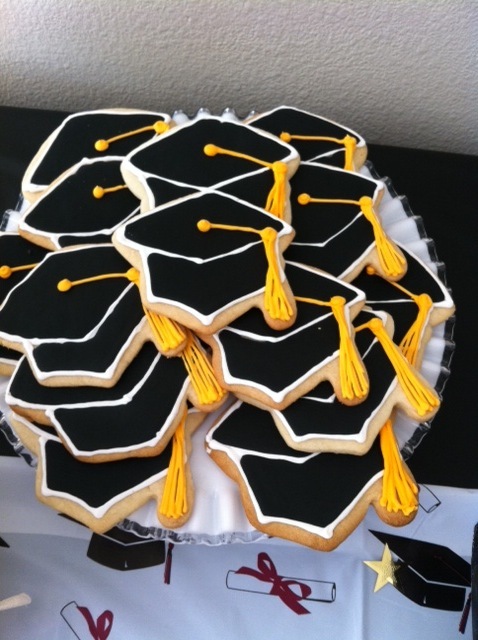 June is graduation season and when I found out I was going to give a graduation party for my sister-in-love, all I could think about was what kind of cookies I could make! I settled on mortarboards, but did not have the right cutter. I could have hand cut them, but thought that may have been beyond my experience (especially considering I had waited until the night before!). I finally found a mortarboard cutter at Party City near my house. These were a little bit of an all-nighter, but I learned so much about making black icing through this experience. I have to say, I will not use anything but Americolor coloring in the future. I used another brand for these little guys and some of my guests teeth were black! However, it didn't seem to affect the flavor because these were polished off pretty quickly! Congrats to Kimberly on her Business degree! Way to go!